purchased 40,000 more acres and leased additional land for military maneuvers, expanding the base to more than 150,000 acres. and active and armed services reserve units. Location. 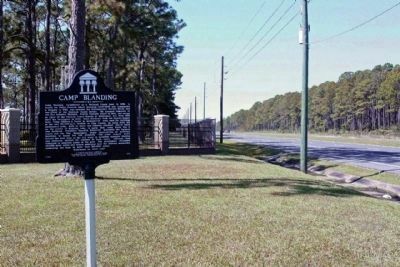 29° 58.891′ N, 81° 59.066′ W. Marker is near Starke, Florida, in Clay County. 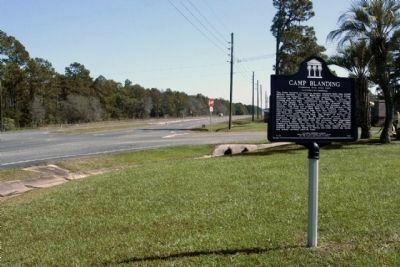 Marker is on State Road 16 near Tallahassee Street, on the right when traveling east. Touch for map. Located near the Main Gate entrance. 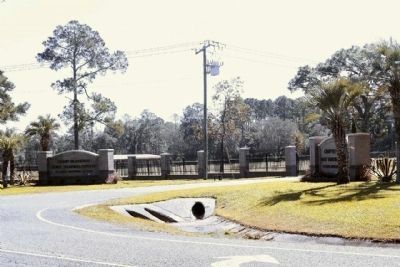 In Clay County, while the postal address of Starke is in Bradford County. 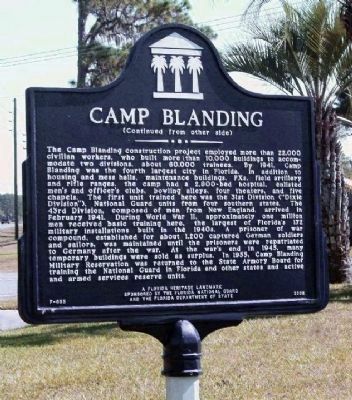 Marker is at or near this postal address: 5629 State Road 16 West, Starke FL 32091, United States of America. Touch for directions. Other nearby markers. At least 8 other markers are within 11 miles of this marker, measured as the crow flies. Woman's Club of Starke (approx. 7.9 miles away); Captain Richard C. Bradford (approx. 8 miles away); General Roy Stanley Geiger,United States Marine Corps (approx. 8.8 miles away); Middleburg Methodist Church (approx. 9½ miles away); Thompson - Chalker Docks (approx. 9.6 miles away); Fort Heilman (approx. 9.6 miles away); Middleburg (approx. 9.6 miles away); Town of Penney Farms 1927 (approx. 10.7 miles away). Touch for a list and map of all markers in Starke. More. 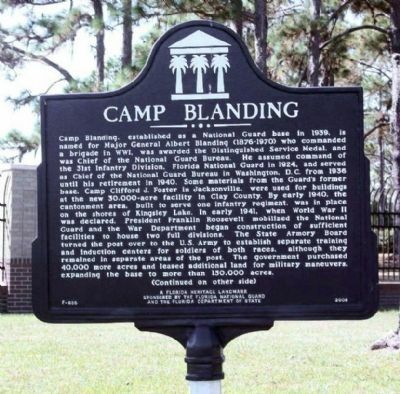 Search the internet for Camp Blanding. Credits. This page was last revised on July 31, 2017. This page originally submitted on November 20, 2013, by Mike Stroud of Bluffton, South Carolina. This page has been viewed 603 times since then and 6 times this year. Photos: 1, 2, 3, 4, 5. submitted on November 21, 2013, by Mike Stroud of Bluffton, South Carolina.